A review of Navien tankless water heaters guides you through the outstanding features that make these units amazing. All Navien models are condensing, and the energy efficiency can reach great 98-99%. There are no other tankless heaters that can achieve that. Navien’s tankless and condensing technology, followed by the superior features, provides the high-efficiency water heating and water flow, including great benefits such as the lower energy consumption and operating costs, reliability, lower pollution and extreme comfort. This is what makes Navien one of the most popular and wanted brands. 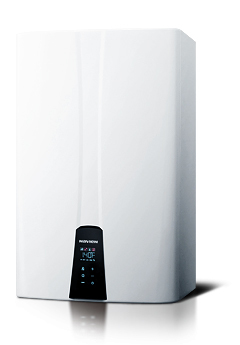 Navien condensing heaters can be found in several sizes and three categories; NCB, NHB, and NPE series, where the NCB series is designed as the gas combination boiler, NHB as the gas heating boiler and NPE as the tankless heater for domestic water heating only, all providing ultra-high energy efficiency of over 90%. Navien gas boilers from NCB series are available in four sizes; NCB-150E, NCB-180E, NCB-210E and NCB-240E, all designed with the advanced technology and for the whole-house use, for both space heating and domestic hot water production. All NCB gas boilers are covered with the 10-year warranty against heat exchanger leaking and due to the quality elements can last very long at least 20 years. Navien condensing boilers from the NHB series, with the maximum size of 24” x 17” x 13” and with the lower power output, are the smallest units from this manufacturer. They are designed for the efficient potable water and hydronic heating, in small and indoor residential and light commercial applications. One of the highest Turn-Down Ratio is found here. Navien NPE models are unique not only because of its high energy efficiency, but because they can utilize home's 1/2" gas line and can be easily converted from using the natural gas to propane in both indoor and outdoor applications. NPE series of tankless water heaters utilize the Front Panel Command Centre for easy setup, troubleshooting, and monitoring of the essential parameters. And with the Intelligent Preheating Technology, showers are much more comfortable since the system recognizes your hot water usage pattern. Navien tankless water heaters from NPE series come with the 15-year warranty. 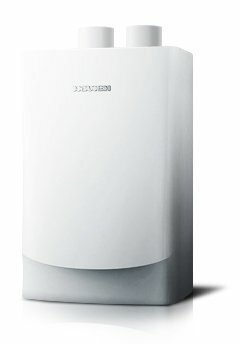 Navien tankless water heaters are unique because of its ultra-efficient water heating in two stainless steel (SS) heat exchangers. There is no other manufacturer that offers that. Most of the other brands have one SS heat exchanger and the other (primary) made of copper. Thanks to its design, Navien heater is fully protected from the acidic environment and its destructive action on the main components. The condensing technology uses the energy from the exhaust gases, therefore, lowering the temperature of the flue gases. As the water heater delivers cooled exhaust gases, Navien recommends plastic PVC venting, which is not only easier to install, but cheaper. For the optimal gas combustion even where the longer vent pipes are needed or working under different air pressure, Navien tankless water heaters utilize two sensors, APS (Air Pressure Sensor) and GPS (Gas Pressure Sensor), which are controlling the air/gas pressure and fan speed. 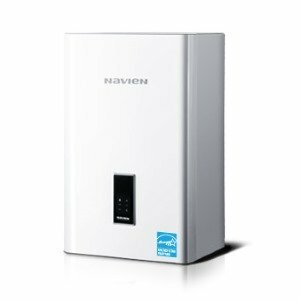 As most of the tankless water heaters on the market, Navien hot water heaters utilize the Eco Pre-mixed burner which lowers the emission of NOx gases. The burner has three stages, from partially to fully lit burner. Gas combustion in the heater's burner is controlled by the microprocessor for the best performance. Actually, there are two microprocessors, responsible for certain operation inside the heater, so the result is better and more reliable water heating. Another great thing about Navien is that they can provide hot water instantaneously, by applying the pump and mini buffer tank into their tankless design. These two features are found on all NPE-A models. This is known as the ComfortFlow Technology so no minimum water flow rate is required anymore. If any of these models cannot meet the requested demand for hot water, Navien recommends the Ready-Link Cascading System to link up to 16 units into one system with no complicated wiring and venting. Such a setup is ideal for larger applications in hotels, restaurants, schools... as every Navien has the built-in controls that allow easy setting. In the end, a remote controller, NR-10DU, comes with every tankless package. The remote control is not only convenient to use and change the temperature, but it is also smart, as it is providing info about problems using the error codes. As seen from the above, Navien tankless water heaters have great benefits and many advantages over other manufacturers. Two stainless steel heat exchangers, high safety, ultra-condensing efficiency and the highest EF in the industry, buffer tank option for reduced "cold-water sandwiches", are some of the reasons why Navien should be your choice when looking for the best tankless water heater. Navien tankless water heater - No! !